Rapid Designs is widely recognized as a leader in innovative applications of Selective Laser Sintering (SLS) also known as Laser Sintering (LS) in the product development, rapid prototyping and additive manufacturing processes. Beginning with rapid prototyping, then progressing to rapid tooling, Rapid Designs team of experts is now setting the standard in using laser sintering for additive manufacturing/rapid manufacturing, a leading-edge application that is generating finished parts direct from 3D CAD solid models, thus saving companies enormous time and expense, and providing unprecedented flexibility in bringing new products to commercialization. In particular, Rapid Designs expertise in laser sintering additive manufacturing has assisted OEMs of advanced-technology products for military applications, where precision and durability as well as speed and flexibility are of critical importance. Symbolizing this leadership, Rapid Designs was honored by Raytheon for its work in producing key components for an advanced mine-hunting sonar system and unprecedented supplier performance. Rapid Designs also specializes in high temperature laser sintering – click for more information on high temperature laser sintering. Selective Laser Sintering (SLS) is a free form fabrication process applying additive manufacturing technology. The laser sintering technology was developed at the University of Texas, originally licensed to DTM Corporation. University of Louisville and Kodak were the first beta sites in 1991. In 2001 3D Systems acquired DTM. Today there are two manufacturers of laser sintering systems: 3D Systems, Inc. and EOS GmbH. 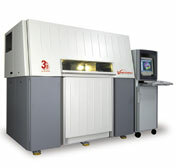 Rapid Designs purchased its first laser sintering system in 1995. Today, Rapid Designs utilizes 3D Systems’ Vanguard HS technology and EOS’ P730. 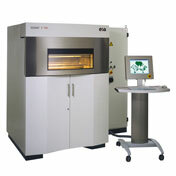 The EOS P730 is a large platform laser sintering system. Its capacity can build parts, or a total volume of parts, up to 27.6” x 15.0” x 23.6” (700x380x600 mm). Laser sintering uses high power CO2 lasers (carbon dioxide laser) to fuse plastic, metal or ceramic particles. Powder particle-size ranges from 20m to 70m. As an additive rapid manufacturing technology, laser sintering builds one layer cross-section at a time from a 3D CAD digital solid model. This is accomplished by tracing a beam of laser energy in the X and Y axis on the surface of the powder. With each successive layer scan the bed is incrementally lowered .002” to .008” (Z vector). This process is repeated one slice at a time until the part build height is completed. Z vector is set by the SLS machine technician based on material processing parameters and/or desired increase or decrease in part accuracy and surface resolution. Part support is accomplished by the un-sintered powder that surrounds the parts during processing. Complete mechanical assemblies can be made mechanically functional simply by removing the un-sintered powder. Trapped volumes are possible as a result of this phenomenon. Powder can be removed by creating small windows or drain holes. This unique attribute is only possible with laser sintering and is enabling design freedoms never before realized in traditional manufacturing paradigms. An example is a lightweight airfoil (wing) requiring no fabrication to assemble discrete components (benefit: no manufacturing fabrication costs) or having no molding witness lines to interrupt aero dynamics (benefit: no loss in design performance and efficiency). Selective laser sintering is unique in that this rapid technology permits multiple parts to be stacked in the Z height and nested inside other parts in the build to optimize the build production efficiency. Rapid Designs is committed to achieving the highest quality SLS parts for our customers. We strive to be competitive but not at the risk of producing poor quality product. This technology has many variables, which invoke the risk of producing lower-cost poor quality parts. Variables that can affect quality include: poor quality powders, lack of materials quality management systems, careless inventory controls, inadequate laser power resulting in poor part density and inferior part strength, poor equipment maintenance, inexperienced operators and inappropriate business practices. Orientation of the part is another factor that can affect the part quality and accuracy. At Rapid Designs we encourage consultation with our laser sintering specialists so they can thoroughly evaluate the application and critical design features. As an example: If true diameters are important, accuracy is best achieved by orienting the diameter in the XY horizontal plane. Another example: If thin walls .020” (.5mm) are in the design, the best results are achieved orienting in the Z axis. Parts made using PA or PAGF can be machined to precise tolerances+/- .001”/” (.025mm). Parts can be bonded, apply threaded inserts, plated, coated, infiltrated, and over-molded. Rapid Designs processes several different base materials that can be enhanced by our proprietary suite of eRMS™ improvements. Selection depends on your application. CastForm™ is a polystyrene base material and is principally used to produce investment casting patterns. Somos™ 201 is a elastomeric material. It has broad appeal for rapid prototyping applications requiring gaskets, seals, face masks, etc. 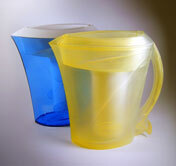 Somos™ 201 can be colored by infiltration or dip coated increasing its applicability. Polyamide is the most common material used for rapid prototyping and rapid manufacturing. Variants or hybrids are commercially available with different fillers: Glass-filled, carbon-fiber filled, carbon (black) filled, aluminum filled. Polyamide is the base material for all hybrids and variants available today. Rapid Designs is committed to materials R&D and process improvement through independent initiatives as well as partnerships and collaborations with universities and suppliers. Rapid Designs – What do we do differently to optimize RoCT? The characteristics that define Rapid Designs. At Rapid Designs we are committed to quality and superior customer service. We have established several systems to insure our clients the highest value and Return On Customer Trust (RoCT). Rapid Designs value is defined by the quality of our product, repeatability from part to part, attention to detail, problem solving, researching new materials and processes, investment in technology, experienced technicians and sales associates, rapid quotes, rapid delivery and a superior second-to-none customer service. We are committed to in-process testing, inspection and measuring our performance. Customer feedback is encouraged and solicited to insure that we are constantly improving our processes and business practices. Materials are tested at each phase, beginning with incoming materials. All incoming materials are traceable with supplier lot numbers. Materials are tested and characterized using a proprietary process before each build to insure the polyamide powder blend and performance is consistent with each build. Glass-filled polyamide is custom blended in-house to our exact requirements. Every part shipped is inspected to Rapid Designs minimum standard Level 4 inspection procedure. Material certifications and Certificates of Compliance (COC) are available upon request and in many instances are automatic depending upon application and industry. Click Here to Contact Rapid Designs for further assistance with your selective laser sintering needs.